My goal in waking up at a time when I would much rather be curled up in bed was to find the Cackling Goose and Ross’s Goose that Jory had found way up north a couple of days earlier. Seeing as I had to be in Plattsburgh for work anyway, and the geese had been hanging out just north of there in agricultural fields in Beekmantown I figured that by leaving very, very early I could get a couple of hours of geese scanning in and maybe, just maybe, get myself a couple of birds closer to my goal of 300 for the year in New York. 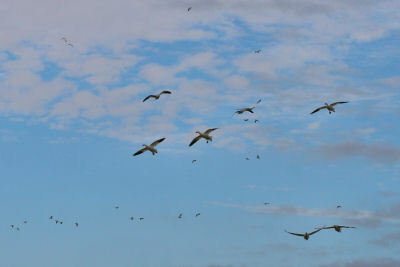 At first all I really noticed was lots of Snow Geese. Thousands of them. One large flock was foraging in a field within fifty meters of the road and a second flock, just as large, was probably 500 meters behind the first flock. 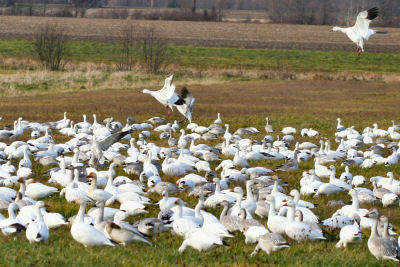 Scanning through the close flock reminded me of how variable Snow Geese can be. 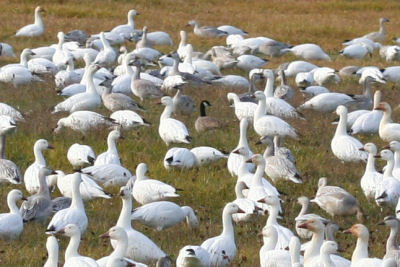 There were adults and juveniles, “blue” Snow Geese and Snow Geese stained orange-red from feeding in iron-rich soil up north. Also present were at least ten birds with yellow neck collars; nine of them had numbers and letters that were readable, so I copied the codes down for later reporting. 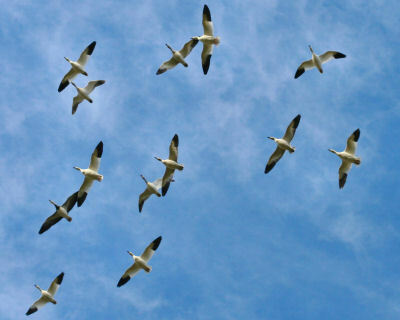 Geese were constantly flying in from every direction and they also constantly flew back and forth between the two flocks. It was quite a sight to see so many geese and the cacophony of goose sounds was amazing. I finally managed to spot, for the first time in my life, two Cackling Geese (they essentially look like small, small-billed Canada Geese) in the distant flock, and what looked like a Ross’s Goose there as well (Ross’s Geese are to Snow Geese as Cackling Geese are to Canada Geese). Before repositioning myself for a closer look at the distant flock I did one more scan of the close flock and spotted a much closer, even photographable Cackling Goose! Once I repositioned closer to the distant flock I confirmed the two other cacklers and the Ross’s Goose. Two more birds down, four to go. I think I’m going to make 300 with time to spare! Several years ago I spotted a lone Snow Goose in a park in my town. It looked pretty haggard and it had a neck collar. I sent the #’s in and they sent me a cool card showing where it had been banded. It had been banded up near Baffin Island in Canada. Pretty cool! Will, you are an albatross around my neck.